Whey protein pills are an over-the-counter dietary supplement used to supplement protein intake. 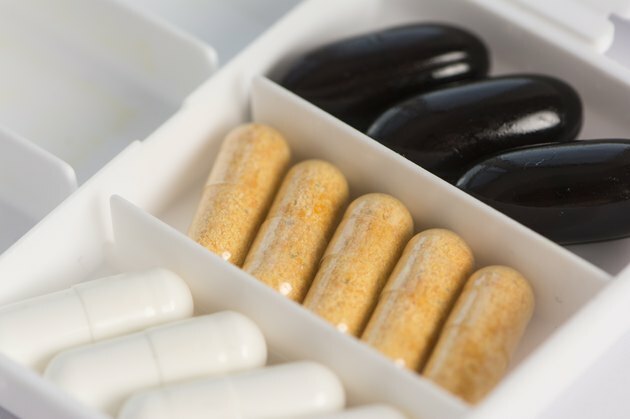 A typical whey protein pill contains only 1 g of protein, according to "Nutrition: Concepts and Controversies," therefore, it is essential that whey protein pills enhance -- not replace -- a healthy diet. Whey protein pills are often used by bodybuilders and others trying to increase their muscle mass, though they may be used by anyone needing to supplement their protein consumption. Consult your physician before taking whey protein pills or any other dietary supplement. Read the instructions on the label of your whey protein pills and ask your doctor for clarification if you are unsure of how and when to take your whey protein pills. Whey protein pills vary in dosage and therefore in use. Typically, two whey protein pills are taken three times per day, according to "Contemporary Nutrition." Take your whey protein pills with meals. Taking whey protein pills with food prevents stomach upset and increases your body's ability to utilize the protein. Drink a large glass of water with your protein pills. Whey protein pills tend to be large capsules and are best swallowed with a large amount of water. Can You Take Glutamine With a Protein Drink?